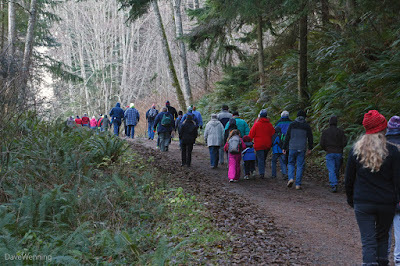 Yesterday, New Year's Day, I attended the fifth annual First Day Hike at Deception Pass State Park. 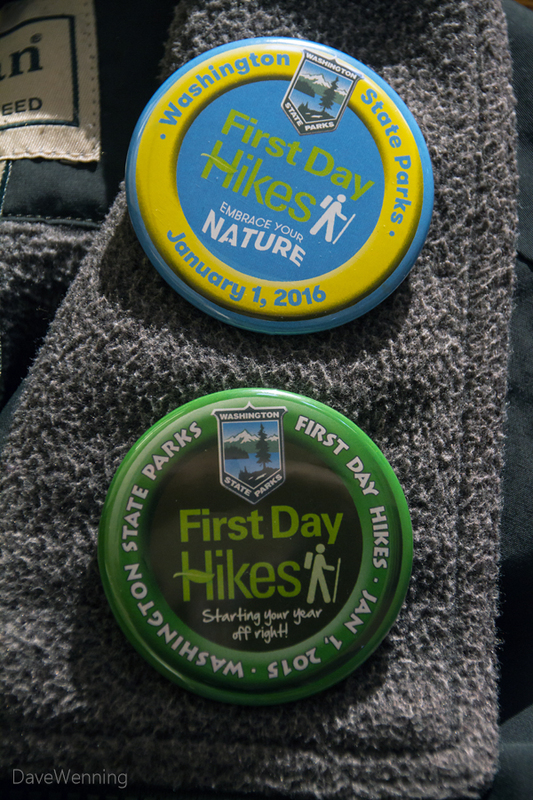 These hikes have become a tradition in Washington State Parks and around the country. Our destination was Hoypus Point which introduced me to a section of the park I had never explored. The one mile trek would take us to the site of an old ferry landing that no longer exists. Before the Deception Pass Bridge opened in 1935, the ferry shuttled vehicles and pedestrians between Whidbey and Fidalgo Islands. We gathered at the State Park docks on Cornet Bay. 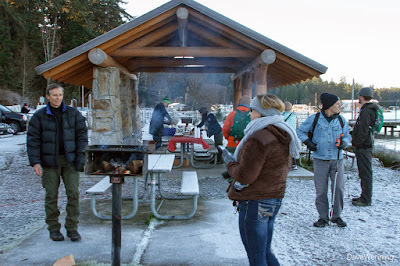 Jack Hartt, Park Manager, pictured left, and Montana Napier (.pdf), Naturalist Interpreter would be our hosts. Under the picnic shelter, coffee, cocoa, banana bread and pumpkin bread were provided by the Deception Pass Park Foundation. Before beginning the hike, Rick Columbo from the Foundation (with hand raised) spoke about the park and its features. 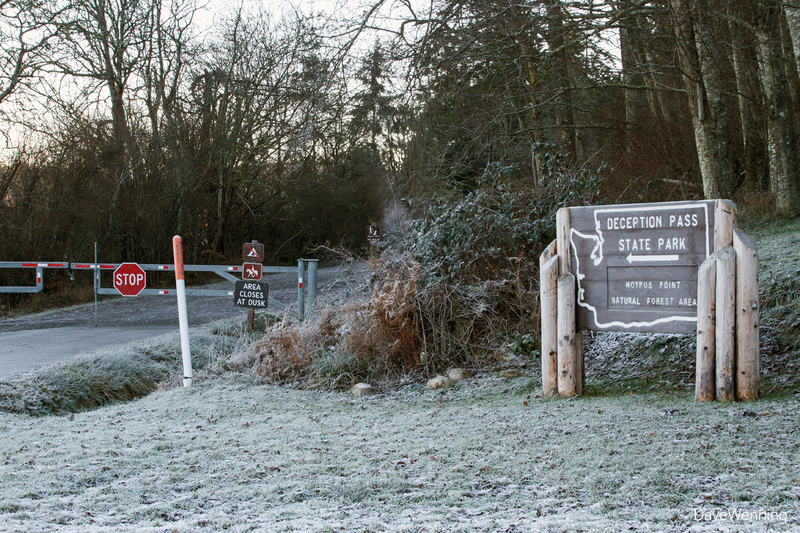 Sub-freezing overnight temperatures had left everything covered in a thick layer of rime frost. 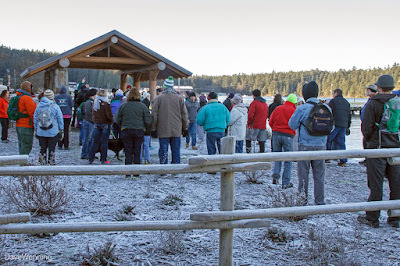 Now, at 32° F (0° C), it was a real winter wonderland setting for our hike. 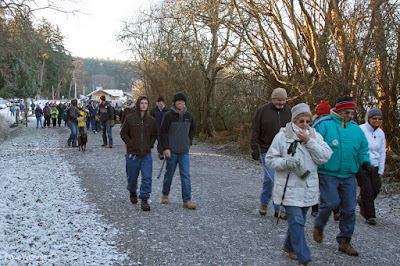 By the time we set off, we numbered more than 150 for this New Year's Day adventure. That's the largest gathering yet for these hikes at Deception Pass. The trail is actually the old Hoypus ferry landing road, now closed to traffic. 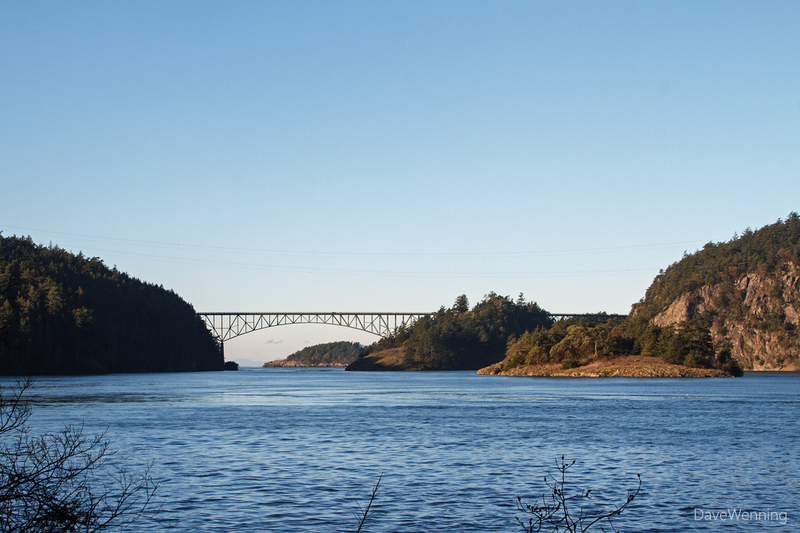 Hoypus Point Road offers some of the best bridge and Deception Pass viewpoints in the park. Hikers added bright colors to the deep shade of the Hoypus forest. 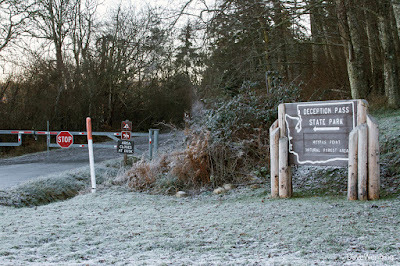 Along the road, two trail heads provide access to the Hoypus Natural Forest trail system. 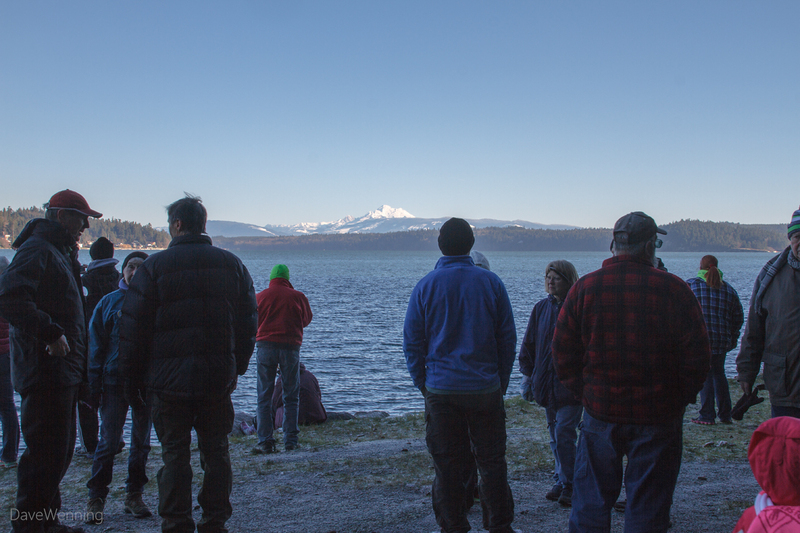 At the site of the old ferry landing, Mount Baker glistened in the bright sunshine. 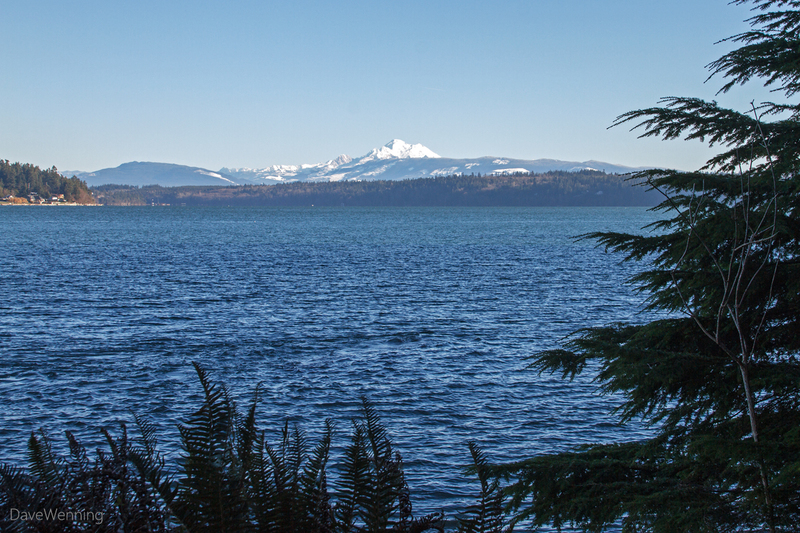 We lingered here for quite a while enjoying the views. 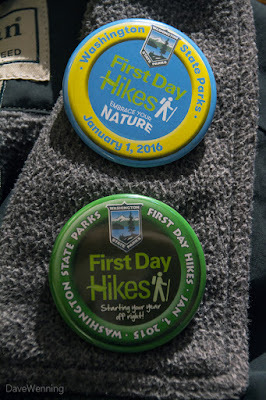 To remember the day, I now have another First Day Hike button for my collection. Excellent. Nice pics . Hope i will go to there in the future.